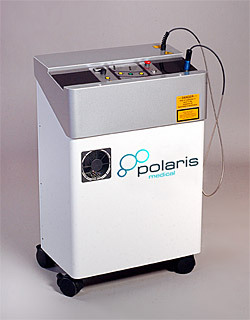 The Bournemouth Laser and Skincare Clinic have been using Polaris Medical Lasers for hair removal since 1998. The POLARIS 1064 Long Pulsed Nd:YAG LASER can be safely and successfully used for the removal of hair on all skin types, Fitzpatrick scale I-VI. One of the many advantages of using Laser light at 1064nm is that melanin absorption is very low. As a result the risk of skin pigmentation damage, either hyper or hypo, is very low, making long pulsed Nd:Yag lasers the only choice for hair removal on skin types III-VI. The Polaris long pulsed Nd:Yag can also be used for the treatment of red and blue, broken capillaries on both the leg and the face. Please see our thread vein removal page for more information. Laser hair removal is a non-invasive and extremely effective therapy which is more permanent and effective than any other treatments currently available. Unwanted hair from excessive or inappropriate hair growth may appear for a variety of reasons. This can cause immense distress and affect self esteem. Methods such as shaving, waxing, chemical removal and electrolysis all have significant limitations and are not always appropriate or effective. The most recent innovation is the use of non-invasive laser technology, which provides a more effective alternative. Our laser hair removal system can offer a treatment, which is more permanent and efficient than other treatments currently available. The laser light passes through the outer layers of skin and is selectively absorbed by the pigment in the hair follicle. The laser energy heats the pigment and effectively disables the hair follicle without damaging the surrounding cells. Mild redness may occur on the treated area but this will only last for a short period. The hairs will gradually slip out over the next seven to fourteen days, leaving the skin smooth and hair free. It is important to note that lasers are effective in removing hairs which are in the growing (Anagen) phase. Follicles in the second phase (Catagen) and third phase (Telogen) will not be affected since the dermal papilla (or root) of the follicle is not yet attached to the follicle itself. As a result, additional treatments will be required once the dormant hairs reach the Anagen phase. Research indicates that between 20% and 30% of hair follicles are in the growing or anagen stage at any one time. As a result multiple treatments are required. The actual number varies from one individual to the next but our experience indicates that a minimum of four treatments are usually required and there tends to be a four to eight week interval between treatments. Yes, laser hair removal is a non-invasive light energy laser, which uses a wavelength that targets only the melanin (pigment) in the hair follicle without any harm or effect to the surrounding tissue. The light is channelled through a lens in the hand piece, which is held gently against the skin, there is a flash as the laser shots are delivered. Protective eyewear is provided for your safety and comfort during the procedure. A specially devised cooling machine will be used beforehand, during and after treatment to minimise any discomfort. You may feel a series of slight pinpricks when the shots are fired. This will depend on the area being treated and can be discussed at your initial consultation. A course of treatment will be required, as the hair can only be eliminated whilst in the Anagen (growing) stage. An average of 4-10 treatments are required. Appointments will be made at 4-10 weekly intervals; again this will be discussed in more detail during your free consultation. Who will be carrying out the treatment? All consultations and treatments are carried out by experienced, specially trained laser operators, who are medically certified. You will be asked to complete a brief medical questionnaire prior to assessment of your individual treatment needs. Based on your hair colouring and skin type a test patch will be performed following your consultation, provided that you are suitable for, and wish to, receive the treatment you will be asked to sign a consent form for this. Why do I need a Test Patch? This is to check your skin suitability and to ensure there are no adverse reactions to the treatment. A period of 24 hours must be left between this and commencement of treatment. Can anybody have this treatment? It works best on dark hair and light skin but other combinations can benefit apart from grey, blonde or red hair, which lacks sufficient pigment. Also certain medical conditions and/ or medications are not conducive to effective treatment. Very few have been experienced. There may be some initial reddening or slight swelling of the area and this can be minimised by the application of cold compresses and aloe vera gel, which will always be applied immediately after your treatment. To enable maximum penetration of light to the hair follicles the skin should be free from oils, lotions, deodorants and make-up. In order to accurately assess the treatment parameters the hair must be visible at the initial consultation. I've just come back from abroad, can I have laser treatment? Newly tanned skins cannot be treated. We recommend at least four weeks before a laser treatment can be carried out. The same applies to sunbed tans and fake tans as they greatly increase the risk of pigment changes in the skin. What method of hair removal is recommended during a course of laser hair removal? You may shave or use hair removal cream between treatments. It is very important that you do not pluck, wax, sugar or receive electrolysis in order for the laser treatment to be effective. It should be noted that after treatment 2 or 3 some clients experience what appears to be a regrowth of hair. This is in fact a surge of hair growing all at the same time, known as synchronous growth and is normal. In fact it means that more of the hair is likely to be in the growing, or Anagen phase at any time. It is simply your hair reacting to a perceived ‘attack’! This will depend on the areas to be treated. A price list is available and if your particular requirements are not listed we will be pleased to provide an individual quotation. By personal cheque, cash and most credit/debit cards. We would appreciate 24 hours notice of cancellation so that we can offer the appointment time to another client, and if cancelled within 24 hours a charge may be levied at the clinics discretion.